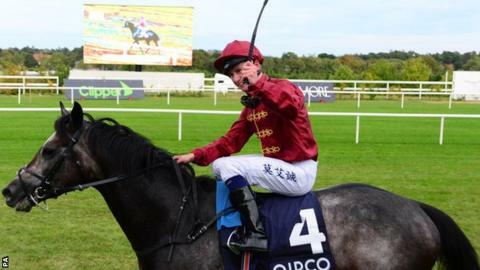 The John Gosden-trained Roaring Lion will not race his stablemate Cracksman in Saturday’s £1.3m Champion Stakes. The winner of three Group One races in succession will instead compete in the shorter Queen Elizabeth II Stakes because of the softened Ascot ground. Cracksman will face other Gosden runners Monarchs Glen and Maverick Wave in the feature race on Champions Day. Sir Michael Stoute’s Crystal Ocean appears to be the biggest threat to Cracksman, who won last year’s race. Aidan O’Brien runs last year’s St Leger winner Capri and the Lockinge-victor Rhododendron. Since 2011, the six-card British Champions Day meeting has been held at Ascot each October, acting as the end-of-season highlight fixture of British Flat Racing.